CATHERINE/LONG LAKE ACREAGE PARCEL -PURE PRIVACY WITH THIS 37 ACRE PARCEL WITH 1500 FEET OF FRONTAGE ON SPRING FED CATHERINE LAKE MAKES YOU FEEL LIKE YOU OWN THE WHOLE LAKE. THIS PARTICULAR LOT ALSO HAS DEEDED ACCESS TO 886 ACRE-FISH FILLED LONG LAKE THAT HAS A PIER. THE PROPERTY HAS ANCIENT HEMLOCKS AND GORGEOUS SUNSETS AND IS LOCATED IN POH-WAH-GOM PASSAGE SUBDIVISION, KNOWN FOR BEAUTIFUL HOMES ALL LOCATED ON EITHER BIG SAND OR LONG LAKE. 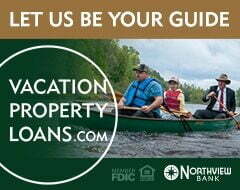 WHETHER SNOWMOBILING, ICE FISHING, ATV-ING, CROSS-COUNTRY SKIING OR SNOWSHOEING, YOU HAVE ACCESS TO ALL THAT THE BEAUTIFUL NICOLET NATIONAL FOREST OFFERS. WITH ALMOST 40 ACRES, 1,000+ FEET OF FRONTAGE, AND ACCESS TO NOT ONE BUT TWO LAKES, I WOULD NOT WAIT TO LOOK AT THIS LOT. PARCELS OF THIS CALIBER WITH ALL IT OFFERS DO NOT COME ON THE MARKET OFTEN.